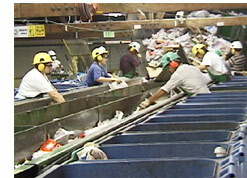 Waste and recycling videos are presented in this section. Topics include municipal solid waste, industrial and manufacturing solid waste, recycling programs and policies of all kinds, waste reduction, zero waste, reuse, salvage and remanufacturing, waste biomass, green waste, composting, waste to energy, purchase of recycled content products, construction and demolition debris, toxic and hazardous waste, and purchase of recycled content building and furnishing materials and supplies. Proper management of residential, commercial, and industrial wastes is a key aspect of sustainability. It is important to figure out how to minimize the amount of materials that end up in landfills and maximize those that are reused for high-value purposes. Such efforts cut down on demand for new raw materials, alleviating pressure on our world's precious natural resources.